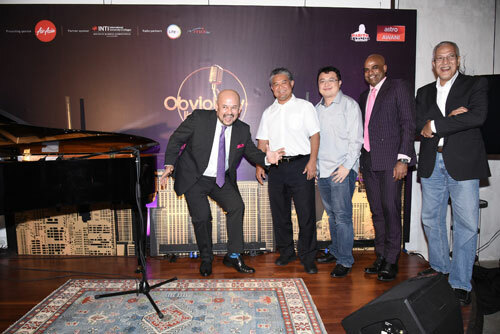 Collaborating with the new and riveting talk show, Obviously Harith Iskander (OHI), INTI is focused on helping busy Malaysians keep abreast on current affairs in a humorous and relaxed environment. The show’s concept which takes on a no holds barred approach to current, relevant and trending issues, perfectly ties in with INTI’s new MBA, Learning Simplified, which focuses on upskilling busy Malaysians to keep them relevant and up to date in today’s fast paced digital era. “INTI is excited for this collaboration as we believe our partnership with OHI has great potential to shake up the nation’s awareness on trending topics and global issues because humor is known to be one of the best ways to keep up to date on what’s happening around the world,” shared Timothy Johnson, Senior Vice President, Corporate Marketing, Products & Partnerships at INTI International University & Colleges. INTI MBA, Learning Simplified, is a programme specifically designed to upskill working professionals to help them stay relevant in the workplace and enhance their career prospects. The programme features a flexible and personalised approach to learning, to accommodate the needs of those with demanding jobs and family commitments. OHI is a joint production bringing together the newsy editorial sense of Astro Awani and the wit and wisdom of Harith Iskandar V Day Productions. Sponsored by AirAsia Berhad (Presenting Sponsor) and INTI International University and Colleges (Partner Sponsor), OHI will air on Astro Awani (Channel 501) every Saturday at 9.30pm starting May 28 and can be live-streamed at www.astroawani.com. Viewers can also catch all the web exclusive content on www.obviouslyharith.com as well as follow it @obviouslyharith across Facebook, Twitter, Instagram and YouTube.